Transatlantic Cruises: Are they right for me? Ever wondered what it would be like to embark on a great ocean liner for Europe, the way your parents’ or grandparents’ generations did? If you’re looking for the luxuries of time, space, and quiet, a transatlantic cruise remains a lovely way to traverse the ocean. There are two ways to experience a crossing. 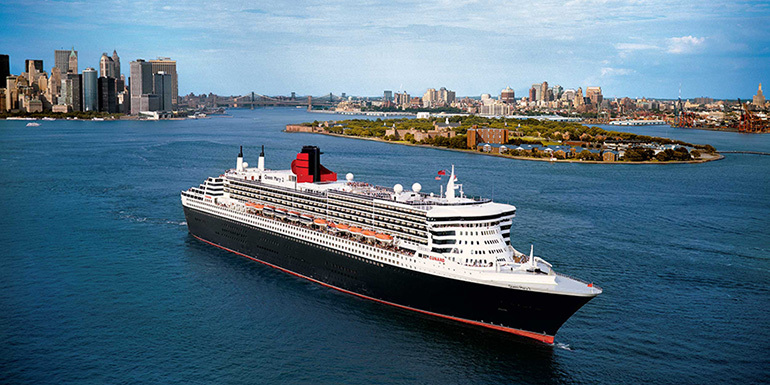 The first — and most famous — is aboard Queen Mary 2, the latest of the great ocean liners built by the historic Cunard Line. The QM2 is the last ship to make regular crossings seven months of the year, between May and January. She sails routes between New York City (Brooklyn’s Red Hook terminal, actually) and your choice of Southampton England (an 80-mile drive southwest from London) or Hamburg, Germany. The second way is on what’s called a repositioning cruise. Dozens of ships cross the Atlantic between winters in the Caribbean and summers in the Mediterranean, and they typically offer six to nine sea days with a selection of ports on either end. These much longer sailings are more of a typical cruise that happens to cross the ocean. 1. You can really unwind. With six or seven full sea days, you have plenty of time to truly slow down. Sleep in, without setting an alarm. Take a seat in the 8,000-book library overlooking the bow, or in a comfy chair beside a big window, and get lost in a long book that has been on your reading list for years. 2. The onboard speakers are truly accomplished. On the QM2, the enrichment speakers aren’t an afterthought; they’re often the type of people who sell out lectures in venues like New York’s 92nd Street Y. You might get to hear a state department official talk about the aftermath of the Arab Spring, see a landscape architect present the ingenious plan behind New York’s Central Park, or hear renowned authors read from their latest masterpieces. Hundreds of passengers show up, and there’s an excited energy in the room. 3. You can indulge in a long meal. Take the time to order all of the courses and share a bottle of wine, followed by conversation over coffee and dessert. During the day on QM2, we recommend the English pub, which dishes out bangers and mash, steak and mushroom pie, and fish and chips — and pours a generous pint. 4. Formal nights are actually quite formal. 5. You can make the time for a long workout. Head to the gym and row, run, or pedal away, without worrying that you need to be someplace else. Find a partner for pingpong or dive into the pool. Feeling more vigorous? Most ships have basketball courts and a jogging path. Best of all, you can look for whales while circumnavigating the ship. Sail westbound from Germany or England, and you can take advantage of the extra hours as you gently pass through five time zones. Have you ever crossed the Atlantic, and what was your favorite part about the trip? Just returned from a transatlantic crossing on the celebrity silhouette it was great . The service was fantastic .Diner and all meals were to live long for. I will be a repeat cruiser.